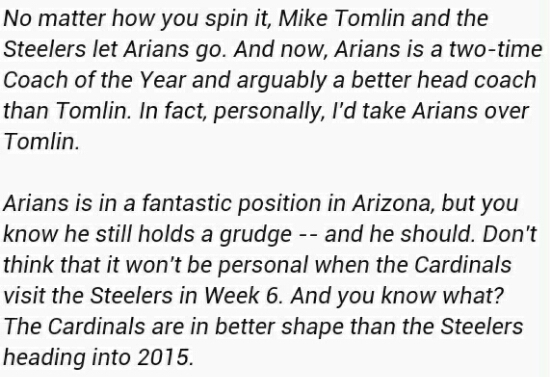 RIVALRY ON THE RISE: Arians/Cardinals v. Steelers | "IT'S A STEELERS WORLD"! 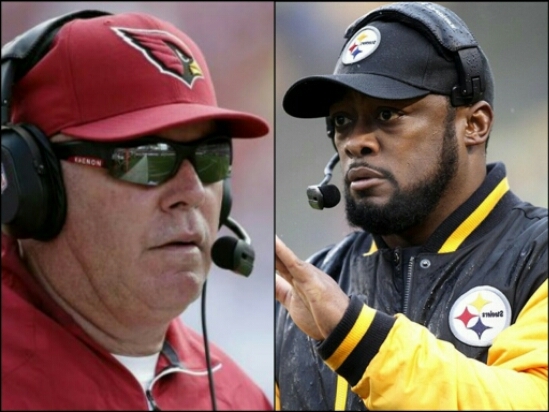 Is the rivalry between the Pittsburgh Steelers and the Arizona Cardinals growing? Or is it the still bitter former Steelers offensive coordinator that makes this matchup so intense? NFL.com writer Adam Schein broke down some of the top feuds in the NFL entering the 2015 season, placing the feud between the Cardinals and the Steelers at 6th on the list. Basically due to Arians. Arians was with the Pittsburgh Steelers from 2004-11, serving as the offensive coordinator starting in 2007. He then “retired,” eventually taking over as offensive coordinator (and later interim head coach) of the Indianapolis Colts in 2012. He was hired as head coach by the Cardinals that following offseason. He led Arizona to an 11-5 record and a playoff berth in 2014. Tomlin has taken the Steelers to the Super Bowl twice in his tenure as head coach, winning Super Bowl XLIII against the Cardinals with Arians as his offensive coordinator. Pittsburgh went 11-5 last season before being eliminated in the Divisional Round of the playoffs by the Baltimore Ravens.